'I am astonished at how rarely the union of music and text succeeds in English-language opera. People invariably point to Benjamin Britten as the gold standard of setting texts in English. But to my (admittedly American) ear, his vocal settings can produce a sensation uncomfortably stilted and oddly archaic. They may satisfy the needs of the English dramatic sensibility, but they are not a comfortable fit for an American ear brought up on everything from George Gershwin and W. C. Handy to Joni Mitchell, Bob Dylan and Stevie Wonder' - from John Adams' Hallelujah Junction, which is, quite appropriately, sub-titled Composing an American Life. 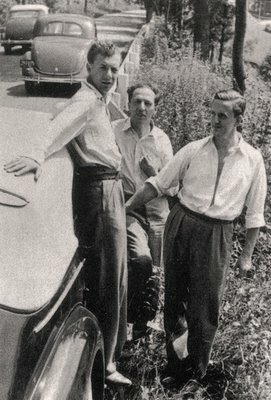 Photo shows Benjamin Britten in upstate New York, 1939 with Aaron Copland and Peter Pears. Another Britten gem here. I suspect I am not the only person to have noticed the partisan tone of Composing an American Life. My copy comes with a Preface in which John Adams spends two pages extolling the virtues of British music. He tells how hearing the Boston Symphony play Vaughan Williams was 'an experience that imprinted me for life'. I can only assume that the Preface was a last-minute addition to the UK edition as the book's index contains not a single mention of Vaughan Williams.